"If you love peanut butter then get ready for the peanuttiest peanut butter flavored cookie you have ever tasted!" With an electric mixer, combine peanut butter, butter, vanilla extract, syrup, and eggs. In another bowl, mix sugars, flour, oats, salt, and baking powder. When the dry ingredients are mixed, fold dry mixture into the earlier (wet) mixture. Add crushed peanuts and peanut butter chips to the dough. Roll dough into balls, pressing slightly with a fork. Bake at 350 degrees F (175 degrees C) for 12-15 minutes, until cookies are slightly browned. 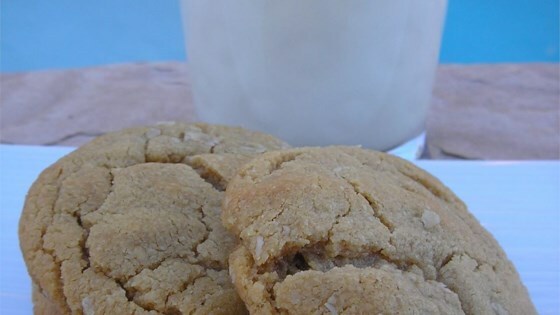 This recipe was good but my family likes the plain peanut butter cookies instead. Very good, and very peanutty. Last summer, at a 4th of July picnic, I used these cookies to make ice cream sandwiches...they were a hit! I didn't have any syrup, peanuts, or peanut butter chips, but it was still wonderful. AMAZING!!! Best peanut butter cookie EVER!